Hug it out! A new study suggests that just reaching out and touching someone — con-sensually, of course — can reduce bad feelings associated with the typical ups and downs of our social interactions. The study from the Department of Psychology at Carnegie Mellon University, published in PLOS ONE, looked at the social interactions of more than 400 people over two weeks. A summary of their daily activities, moods and physical interactions revealed a causal link between emotional states, conflicts and the number of hugs a person gave or received. “Results indicated that there was an interaction between hug receipt and conflict exposure such that receiving a hug was associated with a smaller conflict-related decrease in positive affect and a smaller conflict-related increase in negative affect when assessed concurrently,” the study reads. In plainer English, hugging helped people feel less poorly after some kind of conflict or negative event during their day. This effect was seen across all genders and ages in the study, although women reported more hugs than men. “Our results are consistent with the conclusion that both men and women may benefit equally from being hugged on days when conflict occurs,” the study reads. Interestingly, it did not seem to matter if the huggers were in a romantic relationship at the time of said hug — the mood-related benefits still stood. The study was authored by Michael Murphy, a postdoctoral research associate at the Department of Psychology at Carnegie Mellon. 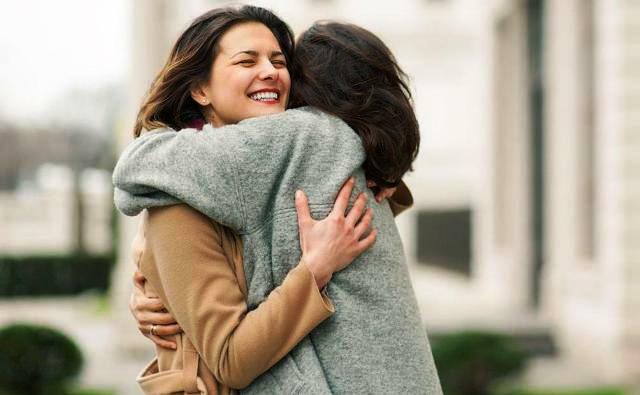 In the study, he says the research could be improved upon by pinpointing exactly what kind of social relationships were involved in a hug — a stranger or someone you were arguing with, for example, as opposed to a lover or an all-healing embrace from Mom. “The lack of specificity regarding from whom individuals received hugs also restricted our ability to identify whether hugs from specific types of social partners were more effective than those from others,” Murphy wrote. Either way, there doesn’t seem to be a downside to consensual hugging.